The Christmas marathon has concluded. We’ve been on-the-go since last Saturday afternoon and haven’t stopped since: visiting with old friends and their families, and then three days of family Christmases. Our first Christmas as a family of three was pretty awesome. Along with a car load of baby gear, gifts, and food was my new camera. Here are a few of my favorite photos from Christmas 2012. My friends from high school (minus a few who couldn’t be there) got together with our families (husbands, kids, moms, and dads). Here we are in 9th grade and then now. My Grandparents, Nanny and Papa, and their great grandchildren. Having been lucky enough to get 17 years with my great Grandma before she passed, this picture makes me so happy. My aunt and cousins and their families. I think of them as the brother and sisters I never had and am glad I could capture this picture of them. My cousins, Quinn and Wade. Such handsome boys with beautiful eyes. Our first Christmas as a family of three. Four generations of Mangan women. The annual family game of Christmas Bingo. Utter chaos and always a good laugh. Bridget’s first glimpse of winter in Ohio. Granted this was taken indoors looking out, but she was fascinated. I think we might have a snow baby on our hands. Bridget with cousin, Keller. They are one month apart and I swear if I took them both out in public together, people would think they were twins. Playtime with the cousins. There’s no rhyme or reason to this picture but I love it. Here’s to a happy and healthy New Year for all. Best wishes! As I mentioned previously, I was not part of the 12.21.2012 Doomsday crowd. However, we had a scare on “Doomsday” that made me second guess its possibility. Friday night was cold and snowy. It took me double my normal commute time to get home. I was officially beginning my holiday vacation. It was definitely an order-pizza-because-I-don’t-feel-like-cooking kind of night. When the pizza delivery man dropped off our pizza, he handed us a box delivered from Amazon that was on our front porch. It was addressed to Brian and I. We weren’t expecting anything in the mail so there was an element of excitement: What is it? Who is it from? When we opened the package, there was a gift note and a return label from a name we didn’t recognize at an address in France. The contents of the package were two shot glasses with images of flames and skulls that read “DOOMED.” First, we were confused. And then we became freaked out. 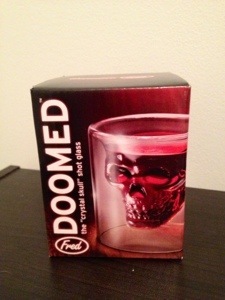 A package from a stranger addressed to us personally containing Doomsday shot glasses ON Doomsday? We took the package out to the garage and called Amazon immediately. When we reported the suspicious package, the customer service agent put us on hold to investigate. She returned and reported that the credit card used belonged to a friend of ours from college. We were a little annoyed at this practical joke that gave us such a scare. It just didn’t seem like something this friend would do. She put us on hold again and came back with more information. 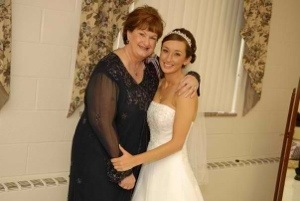 Happy 61st birthday, Mom / Grams / Ma / Kathi! Last year, we celebrated my Mom’s entrance to her 60s a few months early with a surprise party at our house with 75 family and friends. It was the hottest day of the year. My mom is the most selfless, generous person I know so it was a well deserved day that was all about her; just the way it should have been. This year, we’re celebrating more casually with takeout Thai food and a slumber party. I can’t wait. Enjoy your day, Mom! I love you more than words could describe. Between last week’s tragedy in Connecticut and the supposed pending apocalypse, I’ve been doing a lot of reflecting on life recently. This has reaffirmed my belief that every day is a blessing. Every day we get to spend with the people we love is one day more than some are given. With that sentiment in mind, I’ve created what I call my “Reverse Bucket List.” If the world were to end (which I haven’t bought into, by the way), I want to focus on the cool things I experienced in my 28 years; not what I have yet to experience. Before reading my Reverse Bucket List, keep in mind the following: 1) Far above any of the items in this list are the incredible blessings of my family and friendships and the memories we’ve created, and 2) I am a simple person, so my version of “cool” may be ordinary to others, and I am perfectly content with that. – A few years ago, I shook the hand of former President Bill Clinton. This was a totally awesome moment for me. Fortunately, I have approximately 7367863 pictures to remember it. – I climbed the same museum stairs in Philadelphia as Rocky. It was not, however, as easy as he made it look. – I drank a freshly brewed beer in the Guinness Factory in Dublin, Ireland. – I cruised the Alaskan waters with my Mom for seven days. It was cold and beautiful and a week I will never forget. – I occupied a seat in The Big House on the day Michigan broke the record (and still holds today) for most attendees at a college sporting event. – On that same day, us attendees were evacuated from the stadium during the third quarter due to weather conditions. This is the only time in history that a Michigan football game was called due to rain. – I sipped the only glass of wine I’ve ever enjoyed in the heart of Napa Valley. – I was carted in a rickshaw through Central Park. – I spent a week with my closest college friends on a boat in the middle of a lake. We parked in an alcove and didn’t move for five days. It was the perfect way to say farewell to college and hello to the real world. – I have visited 30 of the 50 states, and cities from Boston to New Orleans to San Francisco and Seattle. – I swam with stingrays, unplanned and unsupervised, and survived. – I participated in a flash mob. – I have met two NBA players: Kareem Abdul Jabbar and Lebron James. You can guess which one I liked better. – I toured the English countryside from a train. The rolling green hills are just as beautiful as they look in movies. – I rode a “bobsled” down a portion of the Smoky Mountains. – I shopped at the Mall of America. Quite frankly, it sounds cooler than it really is. – I drove the same route as President Kennedy when he was assassinated in 1963. Eerie, but interesting. – I’ve gone horseback riding. – I stood at the most southern point of the United States. – I played Russian Roulette at a casino and won $50. Beginner’s luck. – Brian and I starred in the Love & Marriage Game Show. Okay, so it was on a cruise, only in front of a few hundred shipmates, and we lost. But, it sure was fun. – In my wallet, I carry an official ‘Friend of Police’ card. Thank you, Brett! – I started this blog which brings me one step closer to fulfilling my lifelong dream of writing a book. Maybe one day. Baby’s first Christmas is officially underway in our household. Although we aren’t going overboard with presents, we have found a few small ways to enjoy and document our first Christmas as a family. After waiting an hour in line, Bridget met Santa Claus for the first time. She was fascinated by his beard and could barely take her eyes off of him long enough for this picture. Brian and I have an ornament from each year that represents that year. Wedding bells for 2008, First Year in Our New Home for 2009, etc. This year has been all about Bridget. Our nickname for her is Bridget Bear, so we chose a family of polar bears to represent 2012. I’ve been patiently waiting for the first snowfall for my next photo shoot with Bridget. Since it hasn’t yet come (which is perfectly fine with me), I took advantage of a festive backdrop at our local mall. As you’ve probably gathered here and here, I am a fan of black and white photos, so I snuck one in but needed to keep the others in color so you could appreciate the adorable hat crocheted by my talented mother-in-law. Today is my dear friend, Kim’s 30th birthday. Instead of a big bash, we opted to celebrate Kim-style with an afternoon at the spa. My four college roommates and I enjoyed a few hours getting manicures and catching up. We then celebrated the big birthday and the upcoming holidays over dinner and cake. Simple; yet a wonderful day. These girls and their husbands are like family to me. I’ve known them since we were nervous college freshman to confident college graduates, brides, and now for a couple of us, Moms. Hopefully our 30th birthdays are just another milestone of many we will share together. Happy birthday, Kim! May your next 30 years and beyond be filled with much happiness and good health. When I became a parent, I learned about an unofficial club. A club of fellow Moms and Dads who can relate to a sleepless night or spit up as the latest accessory; who will celebrate the milestone of the first tooth with you; and who will look through infinite photos of your child and “ooh” and “ahh” in sincere interest. These past two days, I grieved for the families in Connecticut; as a person, an American, and a Christian, but mostly as a parent. I could not shake the image of parents gathered at a fire station waiting for the sight of their child. And even more so, the image of the parents of those 20 children who were never reunited with theirs. As much as I tried, it was difficult not to imagine if that was Brian and I waiting for Bridget. I cried and then prayed, and cried some more. And then I squeezed Bridget a little tighter when I picked her up after work yesterday. I held her a little longer when she woke up in the middle of the night. I snuck in a few more kisses and “I love yous” today. And through it all, I couldn’t help but think about the families who won’t experience these small but amazing blessings again. The day after our family photo session earlier this fall, the photographer posted her camera for sale on Facebook. In a spur-of-the-moment decision, I bought it, and I could not be more pleased with the purchase. Although it’s not technically new, it is new to me (and so are all of the settings!). Inspired by an idea on Pinterest, I hosted a mini photo shoot with our very own “model.” The best part is that it didn’t cost a dime and required no preparation: No backdrop needed; the bloomers were from a dress Bridget wore for my cousin’s wedding; and I used her everyday hat and a string of lights recently purchased to fill the bottom part of our pre-lit Christmas tree whose lights are nearing the end of their life. I’m in love with these pictures (or maybe I’m just in love with the model). She’s looking at her Dad; the person who can make her smile and laugh better than anyone. Bridget has always been fascinated by light so I love the wonder she has in this one. As I mentioned above, there are A LOT of settings on the camera, and I have so much to learn. The lighting I used cast a shadow behind Bridget which kind of ruined this picture, but I had to share anyway. She is such a ham showing off her two teeth. I laugh out loud every time I look at it. Bridget is now six months old, and each month is more fun than the previous one. I’m glad to have my new camera to capture memories from our journey. It’s the most wonderful time of the year…and time for the annual Christmas card exchange. I just love opening my mailbox in December to be greeted by a smiling face or a thoughtful handwritten note. This year, it was a tough task choosing our Christmas card photo. We’ve had an eventful year so how can I pick just one or two photos to represent it? Decisions, decisions. The winner will probably be coming to a mailbox near you in December. But what about the ones that didn’t make the cut? I am obviously biased, but I liked them too much not to share; and what better place to share than here? Bridget enjoying her first “solid” meal: oat meal. Look at that face! Bridget with her BFF, Josie. Bridget’s contagious smile. This could never get old. A typical day in the life of Bridget: jumping up and down. And she loves those cups!